How Do You Spell Awkward? Domo! Please tell me this won't the next big thing: Domo is a mobile social network that makes it easier for total strangers to come up to you and say things like, "Hey, I like the Red Sox and microbrews, too. Let's be friends!" Launching today, Domo is a free application for iPhone and Android that lets you take part of your Facebook profile and broadcast it to any other Domo users in the area. The idea is that others will see your information and "connect" with you. That connection can start electronically, but the idea clearly is that this will facilitate meetings in the real world. "Domo connects people! Domo makes love and peace!" says Takahito Iguchi, Founder/CEO of Tonchidot and a man clearly unfamiliar with understatement. 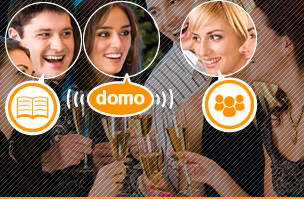 Domo's site (like that of every other Web 2.0 site) portrays a world populated only by happy, pretty young people. And in that dream world, maybe having perfect strangers come up and start chatting with you about your interests sounds great. But in the real world, where bores, crazies and liars abound, unmediated meetings like that sound to me awkward at best and potentially dangerous at worst. Of course it's true that nobody will be forced to use Domo and if I don't like it, I don't have to sign up (I won't). And it's also true that I'm by nature anti-social. So let me know: Am I being churlish, paranoid, both?